Iams Love Tails Contest ~ Pawsitively Humane, Inc. The bond between a person and their pet is the strongest bond and one of unconditional love. Each of you have stories of that bond and how your pet demonstrates that eternal gratitude. Whether it's greeting you or knocking you down as you walk through the house door, licking you feverishly, the dog fetching you a bottle of beer from the fridge or a cat bringing you its leash (yes cats can and do fetch and walk on leashes!) here is your opportunity to share your special story. 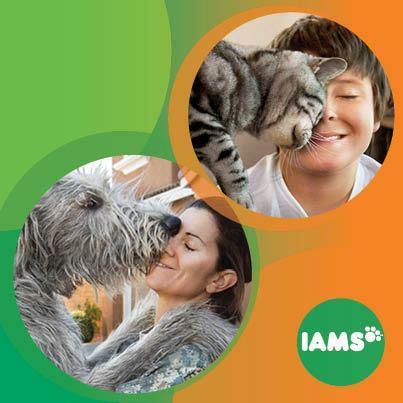 Beginning February 14, Iams will search for real stories from pet owners about the unique bond they share with their dogs and cats. And, the winning two and four-legged “family” will star in Iams next national advertisement! Consumers can log on to the Iams Facebook page from February 14 through March 3 of this year, and follow the easy steps to enter the contest. • Share a photo and tell us in 500 characters or less about the unique relationship you have with your dog or cat and how Iams helps you show your love. • Once the submission phase is over, Iams will select 50 stories (25 dog and 25 cat) as semi-finalists. • From the semi-finalist Love Tails, Iams will select 10 finalists (5 dog and 5 cat) and each will win a cash prize and free Iams food for a year. • In April, Iams will ask its Facebook fans to choose their favorite Love Tail from the group of finalists and one grand prize winner will be selected.